To while away a few hours this week I thought I'd catch up on some Holmes adaptations that I have missed over the years for some reason or another. I thought it would be interesting to concentrate on one story in particular, and chose adaptations of Conan Doyle's finest Holmes story, The Hound of the Baskervilles. Here are my thoughts on what I watched. 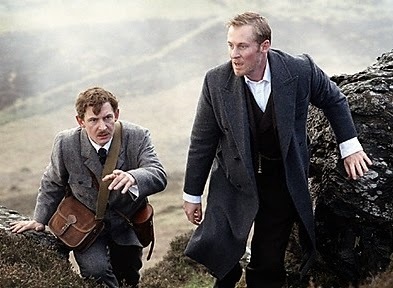 Starring Richard Roxburgh as Sherlock Holmes and Ian Hart as Doctor Watson. Although it took me quite some time to warm to Roxburgh's portrayal of Holmes I ended up really enjoying this adaptation. It was first transmitted on the 26th of December 2002, and due to the fact I was spending the Christmas period at my in-law's house in Ireland I was forced to miss it (this was many years before Sky+ came to the Hayes household). While Roxburgh and Hart did not set the world on fire with their performances they were aided by a very strong supporting cast, which included John Nettles as Doctor Mortimer and the excellent Richard E. Grant as Stapleton (not to mention a very convincing hound). The story differed from that of the original novel on numerous occasions. Laura Lyons, an important figure in the book, is omitted completely. But the biggest difference is the manner of Stapleton's comeuppance and what happened to his wife. I can see how some people would be annoyed at these changes, but in a story that we all know inside out it is good to get a surprise or two every now and again. All in all it was a very good adaptation. It's just a shame it took me nearly twelve years to get round to watching it. 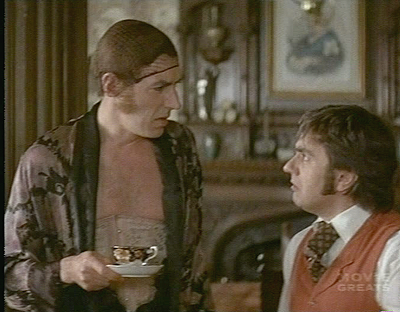 Starring Peter Cook as Sherlock Holmes and Dudley Moore as Doctor Watson. I'm a big fan of Pete & Dud but have given this film a miss until now due to the poor reviews it has garnered over the years (the bad feeling towards it has on occasion earned it the tag 'The worst Sherlock Holmes film ever made'). Having now watched it, I just wish I had heeded their warnings and left it well alone. On paper this should have been a great film, but it sadly lacks Cook & Moore's distinct brand of humour and it quickly degenerates into nothing more than a poor copy of the Carry On films. The lowest point of the film to my eye was the 'One Leg Too Few' sketch, a well known piece shamelessly lifted from Pete & Dud's TV show 'Not Only, But Also'. While it was probably the highlight of the film comedy-wise, it was no match for the original and it showed how badly they lacked ideas. One to be avoided. Caution: watch at your peril. If you want to see Pete & Dud as Holmes and Watson in a less painful form, try their sketches from ITV's 1968 series 'Goodbye Again' instead (if only the film matched these sketches). 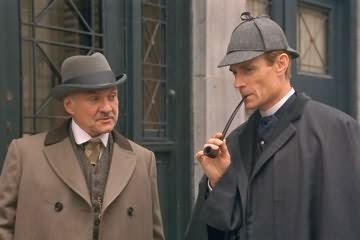 Starring Matt Frewer as Sherlock Holmes and Kenneth Welsh as Doctor Watson. I must admit this adaptation was also one that I was warned about. Matt Frewer's interpretation of Holmes has led to a lot of criticism over the years but seeing as the DVD was only £1.69 at Amazon I had to see for myself. Although Frewer tries his best at an English accent, he still seemed to be in Max Headroom mode with the pitch of his voice rising and falling for no apparent reason (thankfully his inflection is tempered in subsequent films). As Much as I like Frewer ('Max Headroom: 20 Minutes into the Future' is a must watch) I was glad that Holmes is absent for a lengthy period in this story (actually longer than usual) and we are left in the capable hands of Kenneth Welsh as Watson. I was very impressed with Welsh's performance. A strong Watson, who is up there with David Burke and Edward Hardwicke in my opinion. I cannot say I was enamoured with any of the supporting cast (barring Arthur Holden as Barrymore) and the less said about the hound the better. Definitely one for completists only - there are better versions out there.